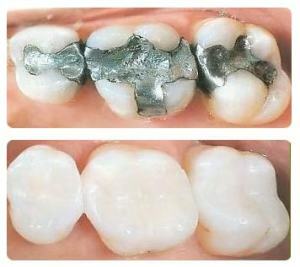 Composite fillings provide good durability and resistance to fracture. They can be bonded or adhesively held in the cavity, allowing us to make a more conservative repair to the tooth. When teeth are chipped or slightly decayed, bonded composite resins may be the material of choice. Bonding also is used as a tooth-colored filling for small cavities. Additionally, it can be used to close spaces between teeth or cover the entire outside surface of a tooth to change its color and shape.